The Optiv Embedded Cloud Security Architect program provides a seamless progression from the plan stage of a cloud security architecture program into the build, implementation and support phase. Our cloud security architect will serve as a natural extension to your team while providing you with access to the insight and expertise of Optiv’s entire cloud security team. 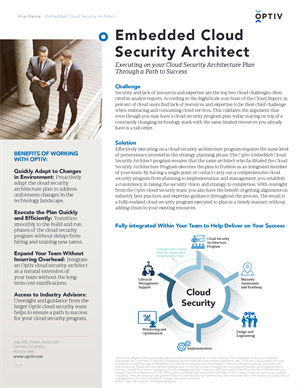 By integrating an Optiv cloud security architect within your team, the roadmap for a mature cloud security program becomes a reality specific to your enterprise.